In 1991 the Phoenix Pride Commission was created. This is a committee that establishes what are known as Phoenix Points of Pride. A Phoenix Phoenix Point of Pride is a place that the committee has specially designated as one that has a special community spirit associated with it — an attraction that you would be proud to recommend to your friends and family. Many of the choices below for Phoenix attractions are Phoenix Points of Pride. I have listed them in alphabetical order because, having visited every one of these Phoenix attractions, I couldn't possibly order them by preference! Known throughout the world as the "Jewel of the Desert," the Arizona Biltmore Resort & Spa has 39 acres covered with lush gardens, glistening swimming pools, and Frank Lloyd Wright-influenced architecture. Set in the heart of Phoenix, the Arizona Biltmore has been a favorite of celebrities and U.S. presidents throughout its colorful history. While you are strolling the grounds of the resort, be sure to stop and see Frank Lloyd Wright's Biltmore Sprites. A walk around the property is free, of course, and the surrounding neighborhood is one of the premier locations in town. A relatively new Phoenix attraction, the Arizona Science Center is located in the downtown area. There over 300 hands-on permanent exhibits, as well as special changing exhibitions. A planetarium show and giant-screen films are also available for an additional charge to the admission price. People of all ages will have a great time exploring, learning and playing. At the Arizona Capitol building near downtown Phoenix you can visit the museum and learn about the history of Arizona and the people who were influential in its history. Step into the original Governor's office, get a feel for territorial Arizona and visit artifacts salvaged from the USS Arizona. This museum is suitable and enjoyable for all ages, and it's free. In central Phoenix stands one of the city's most prominent landmarks. Camelback Mountain is a favorite with more experienced hikers. It is a popular attraction, though, so it can get crowded. It is named Camelback Mountain because its shape resembles that of a camel lying down. It is the highest peak of the Phoenix Mountains. It's got the only roller coaster in town. This year-round amusement park has rides, an arcade and miniature golf. Castles 'n' Coasters is located on the perimeter of Metrocenter Mall in Phoenix. OK, it's just where the Arizona Diamondbacks play baseball, but it is a fantastic state-of-the-art stadium. Formerly known as Bank One Ballpark, it seats about 60,000 people and covers approximately 1,300,000 square feet. You can have lunch inside Chase Field at Friday's Front Row all year long, even when it is not a game day. At Chase Field's web site, you can see how the retractable roof opens and closes in less than 5 minutes! This museum built especially for for kids that are 10 and younger will keep them entertained (and learning) for hours. It is located in downtown Phoenix, and it's three stories of entertaining activities and exhibits that will have them climbing, painting, rolling, driving, shopping, reading and more. In May 2000 Phoenix named this wonderful attraction in the northwest part of the city a Phoenix Point of Pride. This is the location of the Hedgpeth Hills petroglyph site. There are more than 1,500 recorded petroglyphs on almost 600 boulders. Bring your binoculars! The Desert Botanical Garden is located in Papago Park in central Phoenix. This Phoenix Point of Pride combines desert plants with desert wildlife that can both be seen from short trails that are well marked. Items of interest are described in guidebooks. Check the events calendar for classes, workshops, concerts and more. One of the oldest parks in Phoenix, you'll find a playground, pool and small boating area at Encanto Park. There are two golf courses. What really sets Encanto Park apart is Enchanted Island, an amusement park for the little ones. The Hall of Flame Firefighting Museum has almost an acre of fire history exhibits, with over 90 fully restored pieces of fire apparatus on display, dating from 1725 to 1969. It's one of our best kept secrets in the Valley of the Sun. If you want to see and learn about the history and culture of Arizona, this Phoenix Point of Pride is a must see. Located in downtown Phoenix, it is one of the best places to experience the myriad cultures and art of Native Americans of the Southwest. Right near downtown Phoenix you'll find a hidden treasure of harmony and tranquility. It is Ro Ho En, the Japanese Friendship Garden and Tea House. The 3.5-acre garden is an authentic Japanese stroll garden with waterfalls, tranquil streams, a koi pond and more. The garden is open October through May. It isn't really a mystery, and it isn't really a castle but this famous house deserves a visit. Bryce Gully started building Mystery Castle for his daughter Mary Lou, but she wasn't able to see it until after his death. Take this tour of a highly unusual home in South Phoenix built in the 1940s and 1950s. The Musical Instrument Museum, or MIM, is located in north Phoenix and opened to the public in 2010. Visitors here can see and experience thousands of musical instruments from more than 200 countries. There are several worthy theaters in Phoenix, but the Orpheum might be my favorite simply because of the ambiance of the venue. It was originally built in 1929. The City of Phoenix bought the theater in 1984 and it is the city's last remaining example of theatre palace architecture. The theater was restored and re-opened in 1997. This Phoenix Point of Pride is the only theater designated as historic in the Valley. Located near downtown Phoenix, there are many wonderful activities at Papago Park. Besides being a great urban retreat, there are fishing lagoons, a very popular municipal golf course, hiking trails, unique museums like the Hall of Flame fire fighting museum, and an archeological site. You probably will need a couple of days to enjoy all that this Phoenix Point of Pride has to offer. The Phoenix Art Museum has been open since 1959 and is is one of the largest general visual arts institutions in the Southwest. The collection includes over 17,000 works and spans the centuries. The Phoenix Art Museum emphasizes American Art, Asian Art, European Art of the 14th-19th Centuries, Western American Art, Modern and Contemporary Art, Spanish Colonial and Latin American Art, 18th-20th Century Fashion Design, and the Thorne Miniature Rooms. There are also exhibits and special programs for the younger art lovers. Phoenix Theatre is Arizona’s longest running arts organization, having produced over 1,000 productions since its start in 1920. It was previously known as Phoenix Little Theatre. It is located right next to the Phoenix Art Museum. This Phoenix Point of Pride is the nation's largest privately-owned nonprofit zoo. It has more than 1,300 animals, including 150 endangered or threatened birds, mammals and reptiles from around the world. The Arizona Trail at the Phoenix Zoo focuses on plants and animals of the American Southwest. Formerly known as Squaw Peak. Right in the middle of Phoenix you'll find one of the most popular places for climbing a mountain. There are two main attractions at this Phoenix Point of Pride: the Summit Trail and the Circumference Trail. It's 1.2 miles to the peak's summit and a spectacular view. It can be crowded at times. Phoenix is the home of PING golf clubs, and the company offers a free factory tour of the manufacturing facility. A limited number of spots are available for this tour, and reservations in advance are required. Call well in advance to reserve your place on this interesting tour for the avid golfer. Near downtown Phoenix there is a very unique place where you can visit the actual site of an ancient Hohokam village. A Phoenix Point of Pride, the Pueblo Grande Museum is located at 46th Street and Washington. 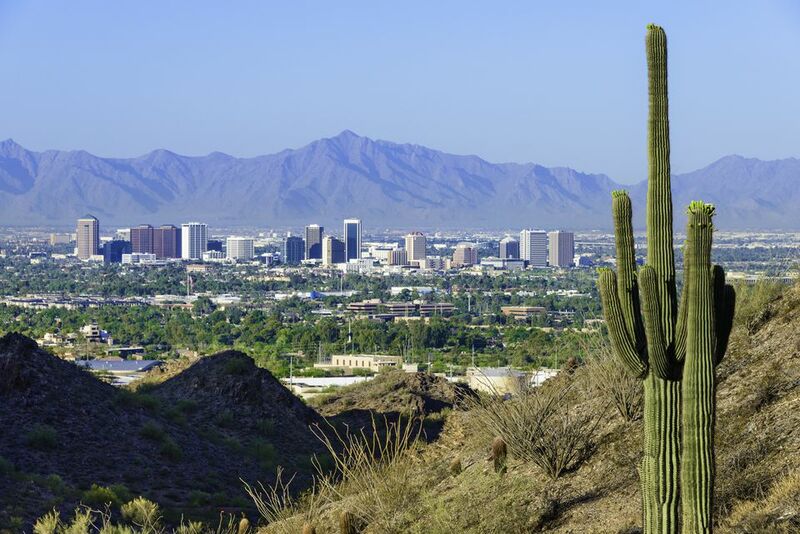 Easily accessible by METRO light rail, it also makes for an interesting and easy-to-get-to visit for travelers who have a few hours to spend on long layovers at Phoenix Sky Harbor Airport. South Mountain Park is the world's largest municipal park covering 16,500 acres. Petroglyphs, hiking trails for all levels, biking, horseback riding and scenic drives and, of course, picnicking, are the most popular activities at this spot in southern Phoenix. I choose Symphony Hall as an important attraction not so much for the building, or the festivals and events that occur at the plaza outside, but for its major tenant, the Phoenix Symphony. In these days of more sports, more movies, and more shopping malls, wouldn't it be nice to enjoy some world class music performed by Arizona's only full-time, professional symphony orchestra? You bet it would. For many years people have wondered what the building is that looks like a wedding cake and sits atop a hill near downtown Phoenix. It's Tovrea Castle. It didn't turn out to be what it was originally intended, but it has an interesting history nonetheless. Now owned by the City of Phoenix, it has been renovated and opened for public tours beginning in 2012. Live horse racing, simulcast races, dining, and family fun at the only race track for horses in the Greater Phoenix area. During the summer take a break from the Phoenix heat at Wet 'n' Wild, a water park in northwest Phoenix. Wet 'n' Wild took over and redeveloped the site from Waterworld Safari. Cool and wet entertainment for people of all ages. Just a few minutes from the Arizona Biltmore you'll find Wrigley Mansion. When the chewing gum magnate purchased the Arizona Biltmore, he wanted a "little bungalow" nearby for he and his wife to visit during the winter and where they could entertain visiting dignitaries. Aside from the fact that there is an upscale restaurant there, and it is a popular place for weddings, you can also take a guided tour and learn about the story of the people and and the property. It's a Phoenix Point of Pride! Mystery Castle in Phoenix: Not a Mystery, Not a Castle!